Banner Finance is the official system of record. The Research Accounting module within Banner Finance is used to account for and report on sponsored awards. The funding instrument type: Grants, Contracts, Cooperative Agreements, Federal/County Appropriations and Gifts are setup and managed within the Research Accounting module. A Grant is established in Banner. The 9 digit “G” number captures the total budget and overall scope of work of an award, and is the umbrella for the related funds/indexes. SPA utilizes a fund hierarchy to assign funding source, Fiscal Monitor (FM), agency, and G# to assist with Banner Finance approval routing and reporting purposes. SPA utilizes a specific naming convention to assign the G# and fund # to designate the NMSU campus a sponsored award pertains to. The naming convention more easily identifies funding for each campus and assists with financial reporting. An index is an abbreviation of the Fund, Organization, Program, Activity and Location (FOPAL) elements. Multiple indexes can exist under one fund. Banner index creation begins when a fully negotiated award is received from OGC through “Workflow”. Once the index set-up is completed, the PI receives a “Congratulations” email. The assigned SPA central accountant/Fiscal Monitor is copied on the email and is your contact for all financial aspects of your award. 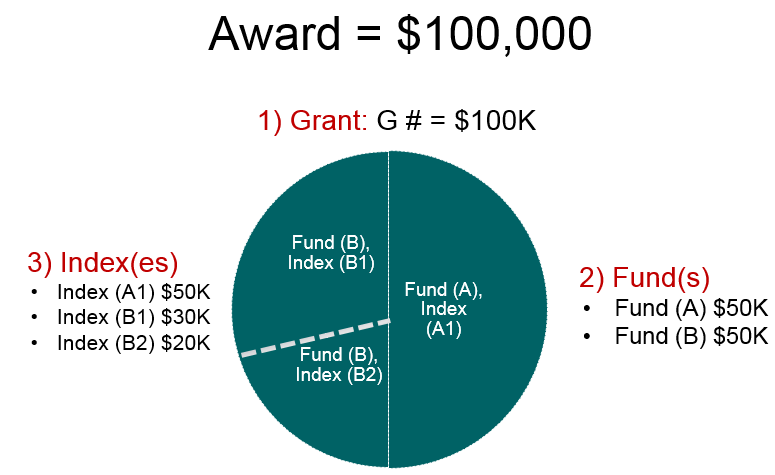 The following demonstrates how multiple indexes can exist under a fund and multiple funds can exist under a Grant. The Banner G# captures the complete financial status of your award so viewing only at an index or fund level may not give you the complete financial status. * Documents 1, 2, 3 and 5 (Documents 4, 6, 7 and 8 may be included if applicable) are required for a new award set-up.